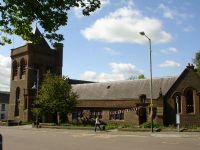 On his death in 1894, the Reverend Alexander Gardner left the sum of £7,000, in memory of his son, towards the building of a new church in Brechin. The Milnes of Mooranbank, local land owners, donated a further £7,000 and Sir John Burnet was appointed as the architect for the new church. The building is built of red sandstone and has a number of interesting features from its Art Nouveau entrance gateway to a medieval monastic style cloister, a singularly unusual feature in any Scottish church. The interior of the church is constructed on a number of different levels, progress from the entrance being ever upwards towards the chancel, whilst the roof is of a highly crafted open timber collar braced construction unique to the church and incorporates a rood beam with three niches, deliberately left empty to avoid thoughts on man’s workmanship rather than that of the Creator. There are a considerable number of both wooden and stone carvings throughout the church ranging from angels on the pulpit to animals on the choir stalls and devils in the stonework. The site also includes a church hall, with an ornately plastered semi-circular barrel roof and a small stage, a session house, modern kitchen and an ornamental garden adjacent to the cloisters.